Fairytale Legends: Hansel & Gretel is the second instalment of the Fairytale Trilogy from Netent, with Fairytale Legends: Red Riding Hood being the first. As the name suggests, the theme of the game is the popular fairytale from the Brothers Grimm about Hansel and Gretel who encounter an evil witch in the forest after being abandoned by their parents. The story in the slot adaptation is a little more uplifting than the original fairytale, and you can win a lot of money together with the siblings. 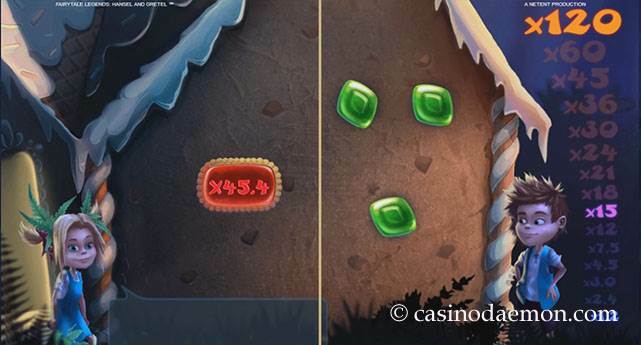 The graphics of the game feature candies for the lower paying symbol combinations and the game logo, Hansel and Gretel for the higher paying combinations. The game is packed with special features, and there is something interesting happening all the time. You can win with 3 random features, a bonus game and free spins. The variance of the game is low to medium, and you should regularly get winning combinations. The special features of the game also trigger regularly and they will keep you interested in this game. This is a game that you can play for just a few rounds or for a longer time. Especially triggering the free spins or the bonus game can be worth your while. The theoretical return to player is 96.71%, which is on the higher end for an online slot. 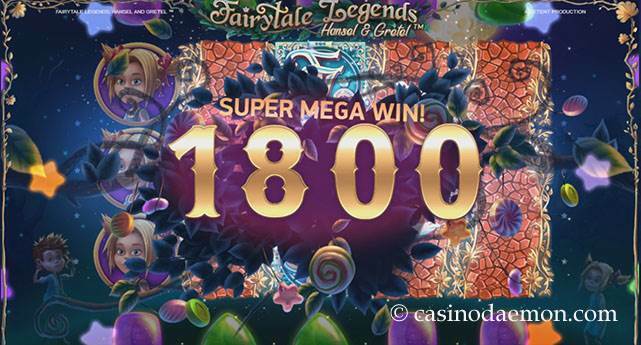 You can also play Fairytale Legends: Hansel & Gretel mobile, as the game is part of the Netent Touch series of games for mobile casinos. Fairy Surprise: this triggers in case you did not get a winning combination. 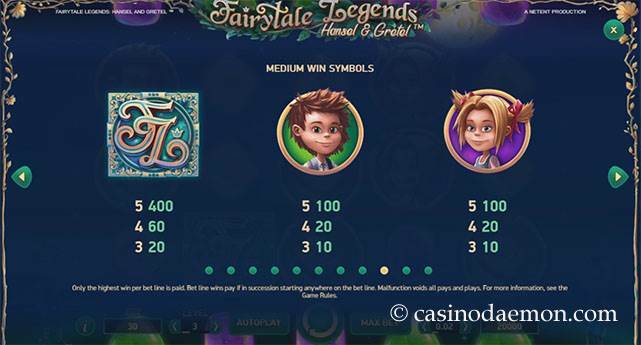 One of the symbols from the reels is selected, and starting with the lower winning symbols, they will change into the selected symbol until you get a winning combination. Fairy Wild Spin: in this random feature, you get two wild symbol stacks on any reel, except reel 3. After the winnings have been paid out you will get another free re-spin with the wild symbols held in place. Fairy Wonder Spin: when this feature triggers you will get a cluster of between 5 and 9 symbols with the game logo overlaying other symbols on the reels. The bonus chest can appear on reels 1, 3 and 5 and when you get all three of them it will activate either a bonus game, 10 free spins or award a coin win of x15 your total bet. Candy House Bonus game: in this bonus game you select 3 of 15 candies. Each candy has a hidden multiplier, and after you have made your picks the multipliers of the candies that you did not select will vanish from the table. Once there are only three multipliers left you will then have the choice of either taking the average of all three multipliers, or you can choose one of the candies to reveal the final multiplier. This multiplier is then applied to your total bet and paid out as a win. 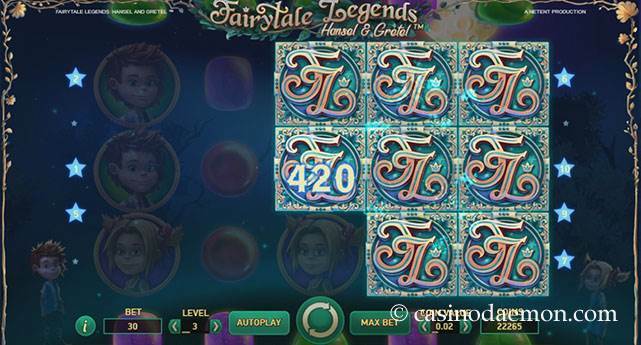 The Fairytale Legends: Hansel & Gretel slot has 5 reels with 10 fixed pay-lines. You can select coin values of between 0.01 up to 2 £/€/$, and you can play up to 10 coins per line. The minimum you have to bet in one round is 0.10 £/€/$, and you can raise your stake up to 200 £/€/$. Automatic play is also possible.